Pierate - Pie Reviews: Reindeer Pie: Rudolf with your nose so bright, won’t you be in my pie tonight?! Reindeer Pie: Rudolf with your nose so bright, won’t you be in my pie tonight?! For a few days ago, I found to my surprise (and couldn’t resist purchasing) a Reindeer Pie from a farmers market in Birmingham! 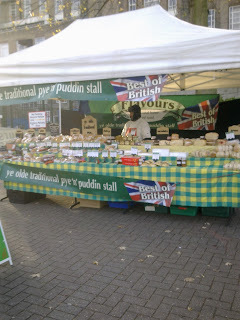 Now, as you can see from the photo this is definitely a pie of the “pork pie” variety i.e. it has been made using cured meat rather than tender meaty chunks and gravy. 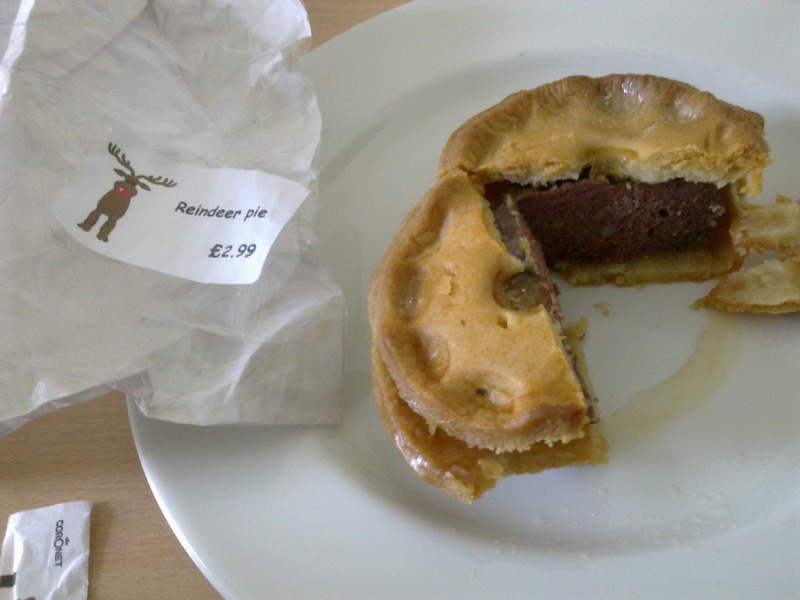 While this was not ideally what the Pierateer would have preferred, the lure of the Reindeer pie was too strong and he was right to give it a go, as while the meat was not as tender and moist as he would have liked, the pastry was very nice and crisp and the meat certainly had a twist to it. Definately tasted more deer like but quite rich. Not your average steak and ale! The capacity was good, however you couldn’t help feel it was slightly padded out with fat, rather than 100% meaty goodness. This meant that while the meat wasn’t chewy, it wasn’t as flavoursome as the reviewer had hoped. However, the pie was in good condition, especially as one would presume the reindeer had flown in to the UK especially to be in this pie! While the price was a bit off putting for its size, the intrigue more than made up for that! While I would have preferred a moister pie centre and proper chunks of meat, it was certainly worth a go. Probably won’t head over to Lapland for another one anytime soon though!